Osun poll: WAEC tenders Adeleke’s result in court – Royal Times of Nigeria. The West African Examinations Council (WAEC) has confirmed that the candidate of the Peoples Democratic Party (PDP) for Saturday’s governorship election in Osun State, Ademola Adeleke, sat for its examination in 1981. WAEC’s confirmation is in its response to an order made on September 11 by a High Court of the Federal Capital Territory (FCT) in Bwari, Abuja, directing the examination body to produce evidence of Adeleke’s result. Justice Othman Musa had, on September 11, while ruling on an ex-parte motion by the plaintiffs, ordered WAEC, to among others, provide evidence that Adeleke sat for its May/June 1981 Senior Secondary School Certificate Examination. Justice Musa also ordered Adeleke to show cause why he should not grant other reliefs sought by the plaintiffs, including an order disqualifying him as a candidate of the PDP for the election. The order was on a suit marked: FCT/HC/BW/CV/122/2018 filed by Wahab Adekunle Raheem and Adam Omosalewa Habeeb. 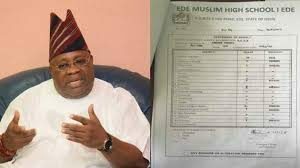 In its affidavit sworn to by Henry Sunday Adewunmi Osindeinde, a Deputy Registrar/Head of School Examination Department, WAEC said Adeleke sat for the May/June 1981 examination at Ede Muslim High School, Yidi Road, Ede, with Centre Number: 19645 and Candidate Number 149. ”The said candidate named in this suit known as Adeleke Ademola, with Centre Number 19645 and Candidate Number 149, indeed sat for the Senior Secondary School Certificate Examination in May/June 1981 conducted by the council at Ede Muslim High School situate at P. O. Box 6 Yidi Road, Ede, State of Osun. Adeleke is yet to file any response to the case and complied with the court’s order asking him to show cause why the plaintiffs’ reliefs should not be granted. It is the plaintiffs’ contention that Adeleke’s claim that he sat for the Senior Secondary School Certificate Examination in May/June 1981 could not be true because Secondary School Certificate Examination had not been introduced then. What was in existence then was the West African School Certificate examination. The court that had slated Wednesday for further proceedings in the case, did not sit because the judge was away on an official assignment. The court’s Registrar, with the agreement of lawyers in the case Bankole Komolafe (for the plaintiffs) and Nathaniel Oke, SAN (for Adeleke), adjourned the hearing till September 25. Also yesterday, the police Adeleke to report to the Special Investigation Panel at the Force Headquarters in Abuja, the nation’s capital. On police findings while investigating Adeleke, the statement said: “Investigation revealed the following prima facie and culpability facts against Senator Adeola Adeleke and four others. “Senator Adeleke made cautionary statement and admitted that he registered for the 2017 NECO examinations as an internal student in the said school and did not sit for the examination but have a result from NECO with seven Credits and one Pass, a copy of which was obtained from NECO by the police. “The Ojo/Aro 2017 NECO, SSCE school photo album (school’s copy) with Senator Adeleke and Sikiru Adeleke photographs in school uniform in the said album. “Senator Adeleke, in the NECO 2017 result obtained by the police claimed that he was born on June 12, 1997 but in his statement to the Police, Senator Ademola Adeleke wrote May 13, 1960 as his date of birth. “The photographs of Senator Adeleke and Sikiru Adeleke appearing side by side in the photo album have no NECO stamps on them. On the charges against the suspects, the police said: “Charges of examination malpractice, criminal conspiracy, impersonation, breach of duty, aiding and abetting against Senator Adeleke and Mr Sikiru Adeleke, Alhaji Mufutau, Mr Ojo and Mr Olutope have been filed at the Federal High Court, Abuja, under the Examination Malpractice Act, CAP E15, 2004 on September 19. Accusing the police of acting the script of the ruling All Progressives Congress (APC) against Adeleke and the PDP, the main opposition deplored the latest police action on the politician.